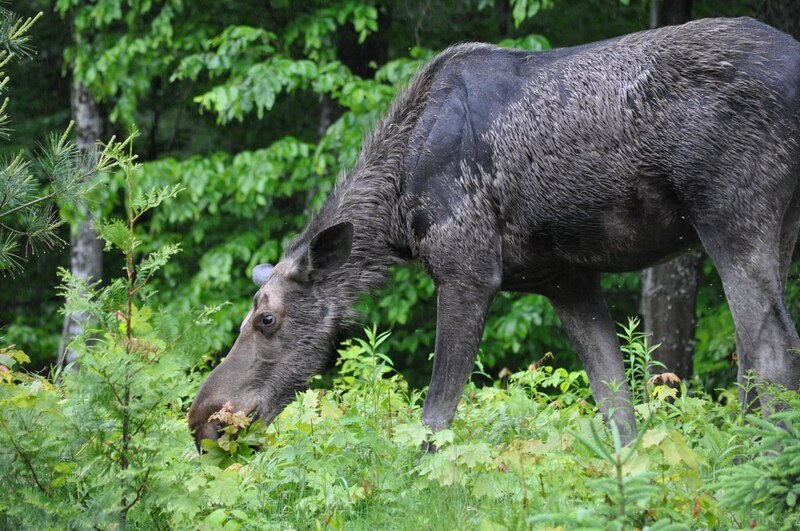 On a rainy, cool day in mid-June, Bob and I found ourselves at Oxtongue Lake ahead of schedule, so we decided to take a spin into Algonquin Provincial Park on the off chance that we might spot a bull Moose. 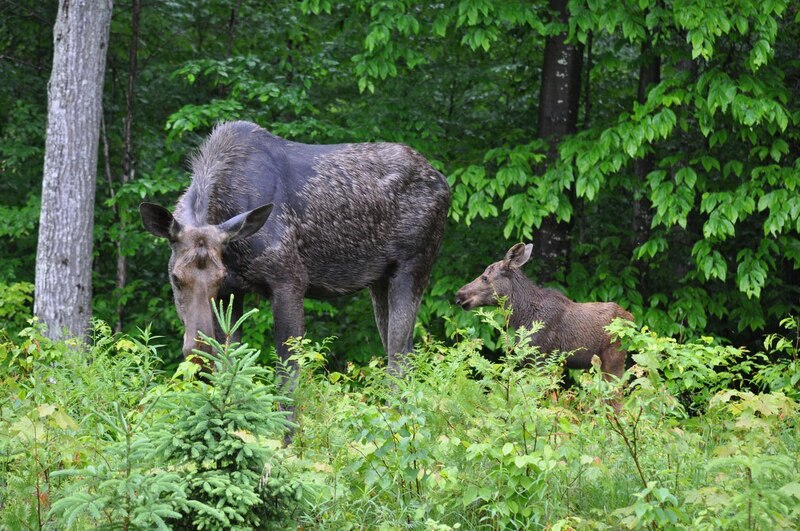 No bull presented itself at roadside, but this darling baby moose with its mother was on the crest of a knoll enjoying a respite from the hordes of blackflies deeper in the forest. A light drizzle was falling when Bob hopped out of the car to snap a few photos, and the pair seemed nonplussed by his approach along the shoulder of the roadway. Being late spring, the lush new growth of vegetation had not attained sufficient height to hide the calf from view, and the calf’s new coat of rusty-coloured hair made it easier to discern against the dark shadows of the forest. Traffic was light on that dreary, dull day, but even at that, a noisy truck traveling much faster than it should along the Highway 60 corridor spooked the cow Moose into moving off towards an apparent gap in the trees. The young calf was right on her heels, its long ears pointed back in concentration. 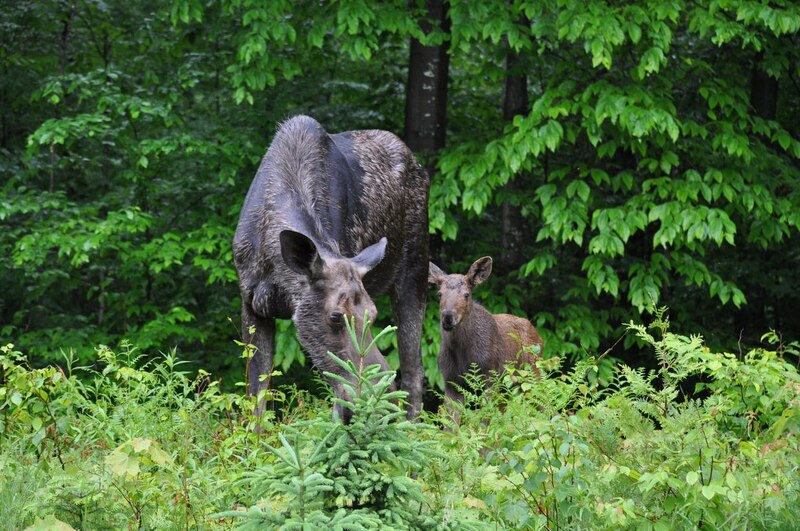 A pair of adult Moose will mate sometime in September or October, and a cow, once pregnant, will carry the baby for a full 8 months. 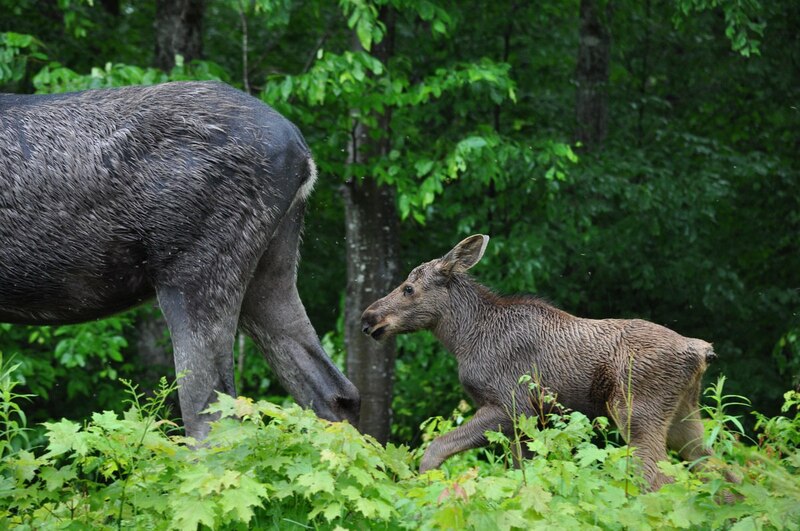 It is typical for a cow Moose to give birth to only one calf in May or June. At birth, a calf weighs between 25-34 pounds and stands about 3-feet tall. This calf that Bob and I observed was not much taller than 3 feet but was sturdy on its feet as compared to a newborn calf that can stand on its own within hours of birth but is spindly-legged and wobbly. That is when they are most vulnerable to predators such as black bears and wolves and why a cow Moose will keep her calf hidden for the first few days of its life. 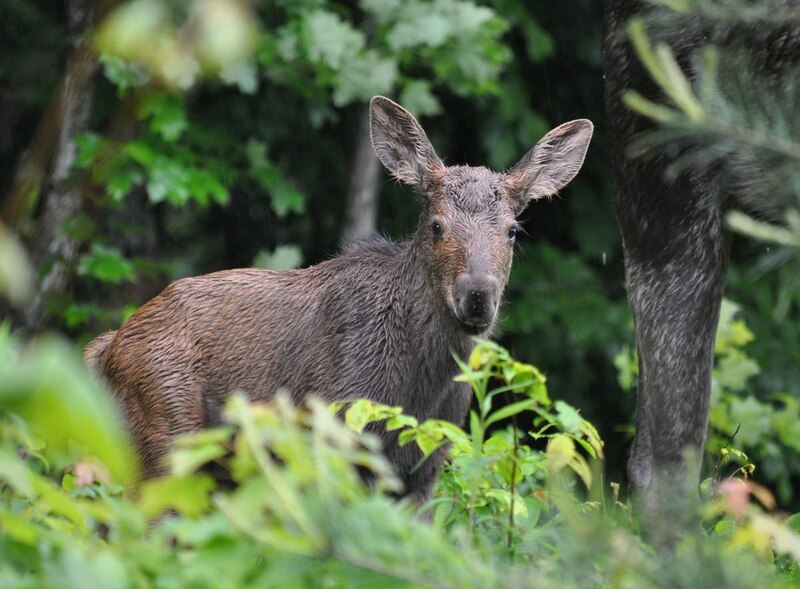 There is good reason that the birth of Moose calves coincides with the season of abundant and highly-nutritious new growth. 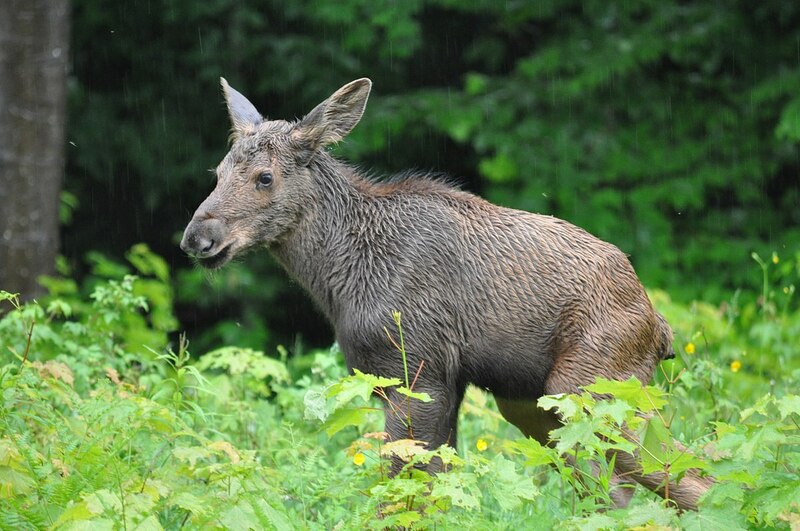 A cow Moose requires a steady supply of fresh vegetable matter in order to produce rich milk for her young baby. 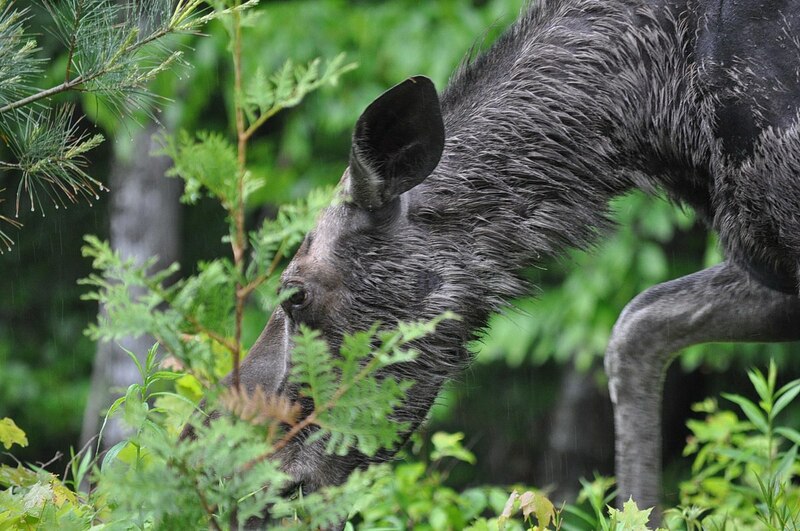 After a winter of eating bark and twigs, sweet buds, tender new growth on deciduous trees and lush green shoots are welcome delicacies that a cow Moose can depend on to keep her healthy and well fed. 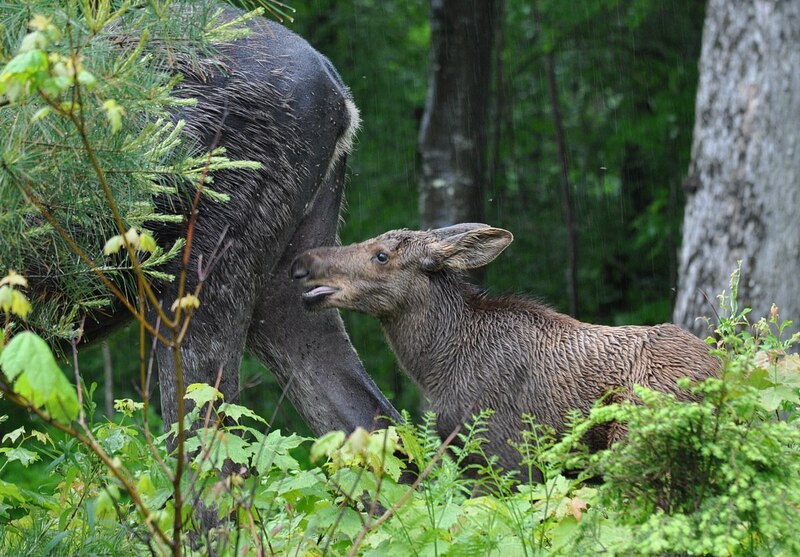 When giving birth, a cow Moose will select a spot near a handy source of browse so she can keep close to her newborn calf while she herself forages for food. A calf will gain about 2 pounds a day while nursing, and consumes only mother’s milk for the first four weeks. Bob and I felt sorry for this pair, so plagued with blackflies that it must make their life miserable. The populations of both blackflies and mosquitoes were unusually bountiful this year, and reports confirmed that more numbers of wild animals are exiting the woods than usual. Nevertheless, the calf was in pursuit of its mother, more interested in latching onto a teat than bothering with the bugs. By three weeks of age, a calf will follow its mother and begin to browse on newly unfolding leaves even though suckling is still its primary source of nutrition. It will be a full five months before a calf is fully weaned, but its capabilities advance in leaps and bounds. By a mere five days old, a calf can outrun a human, and it is taught by its mother to swim by the end of its first week of life. A Moose calf inherits poor eyesight from its parents, but an excellent sense of hearing and smell goes a long way towards keeping it safe. A calf learns early to heed its mother’s warning calls and to keep close by her side, and that is just what this little calf did while we looked on. 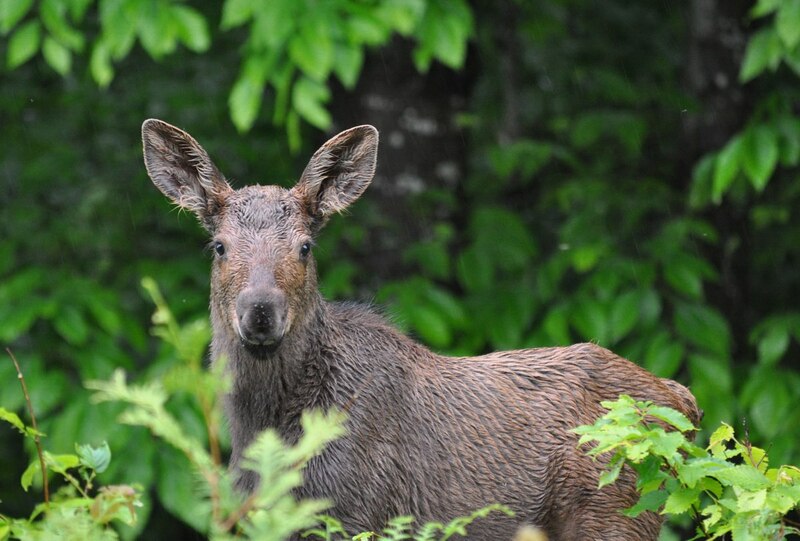 Bob and I did not catch up to a bull Moose on this excursion, but the adorable baby Moose with the over-sized ears, velvety muzzle, and big, brown eyes stole our hearts. We figure it must have been about 3 weeks old, the youngest calf we had ever seen.